Kimi no Na wa. was regarded as a masterpiece by many critics and became an impressive addition to Makoto Shinkai’s accolades, albeit missing out on an Oscar nomination. Box-office records in both Japan and overseas were smashed, and Kimi no Na wa. managed to single-handedly propel both the Japanese film industry and studio-distributor Toho to unheard revenues. This is even more impressive if we consider how Kotonoha no Niwa, one of Shinkai's previous works, was released on just 23 screens. How did all of this happen, and what can other studios learn from CoMix Wave Films, Inc. in order to achieve similar success? This article is the first part of a two-part mini-series analyzing the phenomenal success achieved by Kimi no Na wa. and will cover how Makoto Shinkai managed to produce the highest-grossing anime film of all time, despite the odds. Part 1 will discuss how Makoto Shinkai handled the budget constraints of the film, along with how other anime studios can do the same. A small budget didn’t stop Shinkai’s brilliance, and it shouldn’t stop other directors either. The most common justification of an anime not succeeding is because of budget constraints. Kimi no Na wa. is the highest grossing anime film ever with a revenue of $357,986,087 as of January 2018, and one look at these numbers would have anyone guess that Kimi no Na wa. had a huge budget. However, this is not the case. Even though there has not been an official statement on the exact budget of Kimi no Na wa., Genki Kawamura (the film's producer) told The Hollywood Reporter, "Because [The Garden of Words] took only 150 million yen [$1.3 million], we thought [that] no matter how hard we tried[,] Your Name. could only do 10 times that amount, so the production and promotion budgets were kept really low, smaller than an average Toho release." As shown by Kimi no Na wa., it doesn’t take a large budget to make a critically acclaimed or commercially successful film. The opposite is also true, as we have seen several films in the past fail despite having a large budget. One example is Studio Ghibli’s infamous movie, Tales of Earthsea, which had a budget of $22 million—twice of that of Kimi no Na wa. 's estimated budget. Despite its huge budget, the film failed to captivate Ghibli fans and international viewers alike. Even Hayao Miyazaki, the face of Studio Ghibli, supposedly disapproved of the movie during pre-production, citing the possibility of a failure. Uchiage Hanabi, Shita kara Miru ka? Yoko kara Miru ka? was a major letdown for Studio Shaft fans, as well as fans of the original J-Drama of the same title. The most expensive and time-consuming part of animation is the inbetweening, where traditional key frames have to be hand-drawn by key animators in order to ensure fluid animation. This means that a simple moving train has to be hand-drawn across hundreds of still frames. Key animators are not only expensive to hire, but they also need time to draw these frames. Instead of solely relying on traditional inbetweening, the team of animators behind Kimi no Na wa., led by Shinkai, combined rotoscoping and computer-generated imagery (CGI) to make the movie. This was not the first time Shinkai had done this. Makoto Shinkai is regarded as a modern-style animator who does not rely solely on pen and paper. Voices of a Distant Star is a testament to how computers have dramatically changed the animation industry within the past decade. He created the 25-minute film in merely seven months, using only a Power Mac G4 at a time when PowerPC processors were still reaching for the 1GHz barrier. In an email interview about the evolving landscape of 2D and 3D animation, Shinkai said, "If I had been born 10 years earlier, I don’t think I would be an animator.” This goes to show how innovative Shinkai can be when it comes to animation, up to the point that traditional animators would have probably rejected his methods. "Digital animation, at least in the case of the Japanese animation industry (my films included), is a direct successor of hand-drawn animation," Shinkai wrote. "I would go so far as to say that the industry’s being held back by an emphasis on recreating the techniques of hand-drawn animation. That’s one reason why, even though we’re in the digital age, new ways of representing things have a hard time getting a foothold. I think there are places outside of the realm of Japanese commercial animation where you can find digital animation used as a purely new technique. I think those creating amateur 3DCG and flash animations are able to freely master digital animation to a much greater degree than those in the industry.” Computer-generated imagery is cheaper and faster, but it can stick out like a sore thumb if not done correctly. For example, Berserk has one of the worst CGI animations in recent memory, making it nearly impossible for most fans to enjoy the series. What went wrong? Well, improper planning, lack of experienced animators, and unsuitable animation techniques were mostly responsible for the fiasco. 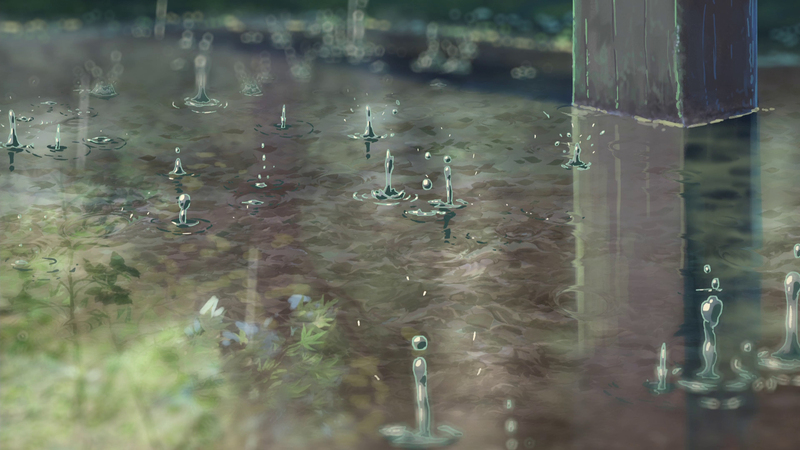 Makoto Shinkai uses CGI, too, but you might never notice it. "Animation is created from two elements, the characters and the background," he began. "Since the intrinsic feel of 3DCG is different from either of those elements, if it’s just used as-is[,] it introduces an unwanted third element to the animation. In other words, it prevents the animation from feeling like a unified whole. To prevent this, when using 3DCG, I try as much as possible to make it look like either part of the cel or the background. I’m not really drawn to 3DCG as an individual... but the down side to hand-drawn animation is the cost. Because of budget and scheduling issues, there’s going to continue to be a need to substitute in 3DCG. And[,] as long as that’s the case, there’s a need for the technology to continue to advance in its ability to represent things." Makoto Shinkai uses what is called a cel. The cel is an important innovation to traditional animation, as it allows some parts of each frame to be repeated from frame to frame—thus saving labor. A simple example would be a scene with two characters on screen—one of whom is talking, with the other standing silently. Since the latter character is not moving, both can be displayed in this scene using only one drawing with one cel or layer. Meanwhile, multiple drawings on several cels are used to animate the speaking character, who is then placed on top of the earlier cel or layer. Shinkai also uses a technique called rotoscoping, which is used to trace over motion picture footage, frame by frame, to produce realistic action or motion. This scene from Kotonoha no Niwa was made using a combination of hand-drawing as well as CGI. On top of music and animation costs, voice acting is also a key factor in the budget of an anime. Well-known names, like Kana Hanazawa and Yoshitsugu Matsuoka, would increase the cost an anime by a lot if they played a major role, so Shinkai opted for lesser-known names to voice the main characters. Hanazawa actually made an appearance in Kimi no Na wa., but since she played a very minor role, her number of hours was significantly less. This meant she didn’t have to be paid much for her part in the movie. Make no mistake: Mone Kamishiraishi, the voice actress for Mitsuha, and Ryunosuke Kamiki, the voice actor for Taki, are both very talented individuals, but since they are less popular, they cost less to employ. Any production company will benefit hugely from the smart allocation of resources, as it allows breathing space for any miscellaneous costs. Furthermore, it will provide animators, actors, and musicians a sense of the direction for the movie—what can and cannot be done with the resources at hand. Poor resource management leads to poor animation quality, forced cuts to the story, and a rushed, underemployed production. Going back to Uchiage Hanabi, Shita Kara Miru ka? Yoko Kara Miru ka?, too much of its budget went into the music production and payment for the voice actors and actresses. Consequently, this forced Studio Shaft into using cheap, rushed, and unprofessional use of CGI, as well as drastically cutting some parts of the story. Animation companies should take Kimi no Na wa. as a prime example of how an excellent team led by a brilliant leader can make a masterpiece from a small budget, if used correctly. In the next part of “What the Anime Industry Can Learn from Kimi no Na wa.”, we will look at how Kimi no Na wa. managed to captivate its target audience, both in Japan and overseas. 3D animation is often used alongside 2D as a way to cut costs. But is that all it's good for?